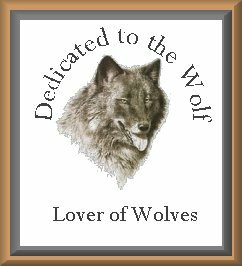 Hi, my name is Mark Keyworth and I bet you are wondering why I chose loverofwolves as a title for my page, because that is what I am a Wolf Lover. The wolf is a majestic animal and a very misunderstood animal, that only wants to be left alone and survive. But we two legged animals in all our infinite stupidity nearly hunted them to extinction. Why?, because we are greedy we want it all, all the land for ourselves instead of sharing. 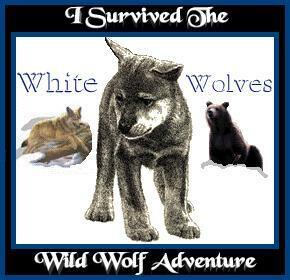 The Wolf was killing sheep and cattle but only after we crowded them and killed all their natural game. We need to learn to co-exist with Mother Natures creatures and protect them, not destroy them. 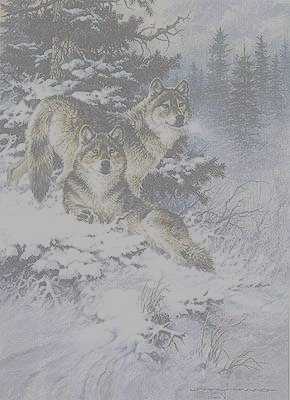 The Wolf along with other nearly extinct creatures are on their way back, and I for one am glad to see it. We need to preserve our wilderness and wildlife for generations to come so they can enjoy, and experience the grandeur of Mother Nature. Lets learn to co-exist with the wolf and other creatures not destroy them, after all this place we call earth was theirs first. This page is dedicated to their reintroduction to the lower 48 States and in particular the Adirondack State Park of New York. More Useless Facts about me! I am an outdoor enthusiast, I like Hiking, Camping , Whitewater Rafting and fishing. I love sports both playing and coaching, I coach youth and High School Football and play Lacrosse, Softball, Flag Football, and Basketball or at least I attempt to. I have a gallery of some whitewater rafting pictures of some of the rivers I have rafted so check them out. A 2nd gallery (under construction) has some pictures of the Adirondack Park in NY where I am originally from, and future home of the eastern timberwolf. If you want to know more just ask me I'll be around. Please visit some of the links I have at the end of my page and dont forget to sign my guest book. Thanks and enjoy. Up on the moonlit hill. With years I left behind. Two species of wolves exist in North America; the gray wolf, Canis lupus, and the red wolf, Canis rufus. The historic range of the gray wolf included most of North America, from central Mexico to the Arctic Ocean, except for red wolf habitat in the southeastern United States. 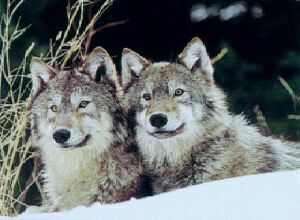 As European settlement expanded into wolf habitat, interactions between wolves and humans became more frequent. Several effects of this settlement played and important role in the decline of wolf populations. First was the clearing of forest habitat in the Eastern United States. 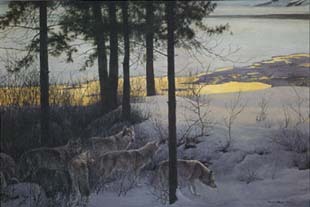 This was accompanied by a significant over-hunting of deer and elk, the preferred prey of the wolf. 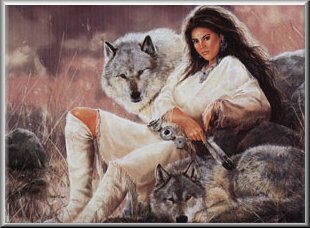 Lastly, as settlers turned to raising livestock, fear of depridation led to eradication programs that poisoned, trapped, and shot remaining wolf populations. In 1914, Congress authorized funding for the removal of all large predators, including wolves, from federal lands. 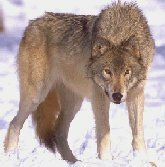 By the 1940's, humans had eliminated red and gray wolves from almost all of their historic range in the lower 48 states. In 1967, the timber wolf subspecies Canis lupus lycaon, was listed as endangered under the Endagered Species Preservation Act of 1966. In 1978, the Secretary of the Interior declared the Minnesota population of wolves as threatened and all other North American gray wolf populations south of Canada as endangered with out reference to subspecies. In 1894, the New York state constitution stipulated that two and a half million acres of the six million acre Adirondack Park, the largest wild area east of the Mississippi, would be "foreverkept as wild forest lands." However, while remaining relatively wild, the park is missing a key component of its ecosystem-the eastern timberwolf. The Eastern timberwolf(Canis lupus lycaon), a subspecies of graywolf, once reigned as the top predator in the great North Woods. Through selective predation on deer and moose, wolves kept these large plant eaters in balance with the ecosystem, and by reducing the overabundant plant eaters place on forests, wolves played an important role in preserving biodiversity in this region. 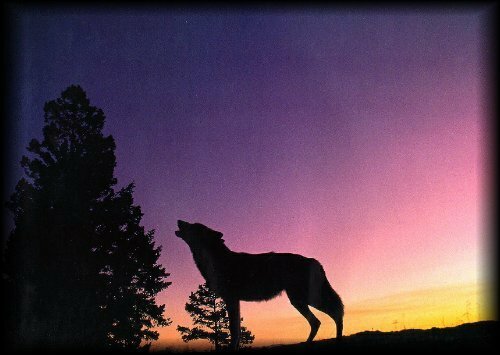 Unfortunately the howl of the wolf has not been heard in the Northeast for One hundred years. 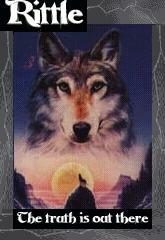 European settlers harbored a deeply instilled fear of the wolf and persecuted them relentlessly. Beginning in 1630, the Massachusetts Bay Colony and others paid an average months salary for the head of a wolf, encouraging bounty hunters to shoot, poison, and trap this misunderstood and undervalued animal. Bounty records show that the last Northeast wolf was killed in New York in 1897. The wolf has been missing from New York for 100 years. Scientists believe that the likelyhood of natural recolonization to the Adirondacks is extremely low. Extensive agricultural lands, busy roadways, and the St Lawrence Seaway ( which remains open to boat traffic during the winter) all stand between the Adirondacks and the nearest wolf population in Canada. The infrequent wolf that may reach the Adirondacks from Canada would have no other wolves to breed with and might interbreed with coyotes. 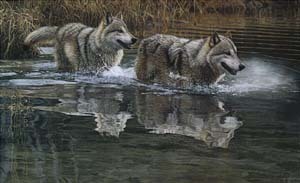 The goal of establishing a pure wolf population would be most efficiently met through reintroduction. 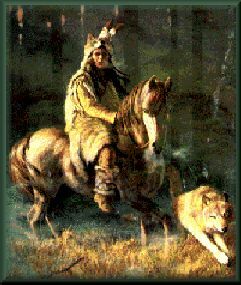 Wolves and Native Americans began as kindred creatures, both highly social beings that lived of the hunt and depended upon ritual to keep order. The two hunted together, and their spirits touched! Today the the eastern timber wolf survives in only 3 percent of its historic rangein the United States. Its future hinges on a remnant population of about 2,000 wolves near Lake Superior in Minnesota and about 200 wolves scattered throughout northern Wisconsin and Michigan's upper peninsula. Establishing a strong geographically separarte population would return the eastern timber wolf to more of its historic range and make its future more secure. And since scientists have recenly determined that the Great Lakes wolvews may be genetically distinct, Defenders believes the imperative to restore the wolves to the northeast is much stronger than ever before. Sites in northern Maine and New Hampshire,eastern Maine, and New York's Adirondack State Park are possible sites for eastern timber wolf reintroduction selected by the U.S. Fish and Wildlife Service. Defenders are urging serious consideration for reintroduction into the Adirondack State Park, as well as advocates careful study of the other areas for reintroduction. Returning the timber wolf to these areas would not only protect the wolf, but would enrich the quality of these ecosystems. Why restore the wolves you ask? Wolves benefit the ecosystem. They play an important role in preserving diverse plant and animal life by virtue of being top carnivores. Because they are wide ranging animals, ensuring the resources for their survival will ensure the survival of a great number of other species. Reintroduction of the wolves will also likely displace a large percentage of the coyote population and wild dogs, which in turn could reduce the predation on deer, and reopen niches for smaller carnivores that have been out competed by the coyote and wild dog. Reintroducing the wolves, benefits we two legged animals economically, by adding an allure to the wilderness that few people can resist. Nearly everywhere wolves exist, regional economies have seen significant increases in tourist generated income. This is evdenced by the fact that every year thousands of people tour Algonquin Park in Ontario, Canada with little chance of seeing a wolf. Yet, each summer they come by the thousands with the hopes of hearing a wolf's howl. Each year Park Rangers conduct Howling events that regularly attract up to 500 cars filled with eager wolf enthusiasts. In North Carolina (where red wolves were reintroduced ten years ago) and Yellowstone National Park (where timber wolves were reintroduced), an increase of four to ten percent in tourism was seen which yielded millions of dollars for the local communities. Adding a charismatic and majestic species like the wolf to the Adirondack's diversity of wildlife would no doubt have similar effects on the local economies. 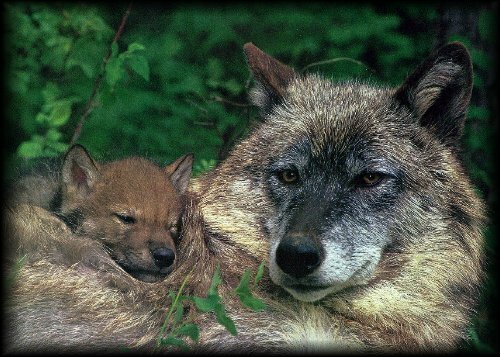 While wolves have been gone for one hundred years, the importance of their loss has only begun to be relized in the last two decades. many ecologists fear that the negative impact we have seen are only the tip of the iceberg and that the full impact of extirpation of wolves may not be realized for generations to come. Heavily Populated areas may never support wolves again, we have an obligation to our environment, to our generations to come, and most importantly to the wolf to seek out the remaining wild areas which can still provide a stronghold for a beautiful, majestic, and misunderstood creature, The wolf. "We Will Be Known By The Tracks We Leave Behind.."
Myth: Wolves are dangerous to humans. animals by removing inferior animals from the populations. Myth: Farmers will suffer economic hardship as a result of wolf recovery. wolves, are extremely low a fraction of one percent in both regions. that pays fair market value for verified livestock losses to wolves. Defenders has committed to extend this compensation fund to New York. land-owners more flexibility in controlling problem animals. Myth: Wolf recovery will require land acquisition or land use restrictions. Northeast would contain no restrictions on land use. 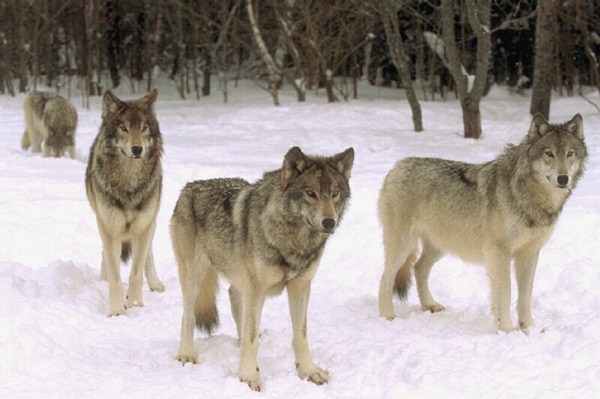 Myth: Most people in the Northeast oppose wolf re-introduction. Myth: Wolves will spread disease. to state thru the years. To listen to the call of the wild. Running, hunting, trying, surviving, and dying. The wolves have no home anymore, thats why they are crying. For Miles and miles howls are heard discussing their fates. Humans dont care for this animal; wolves are forgotten then killed. Humans don't know wolves have no hates. That's why a wolf doesn't end up at Hell's gates. 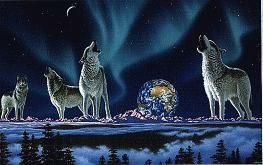 Dark night color blue; wolves' images are relived on 14 Karat gold plates. The round moon is the only light they see. Humans keep destroying a beautiful home. Wolves aren't dumb; they know they have no place to roam. At night is the call of the wild. Something pure on this Earth; like a newborn child. Cool air, water, and snow once demolished their fear. There is nothing out there anymore; nothing but tears. For fire now dwells on the western land. A newborn wolf pup sees his life has been altered. No soft land to comfort your paws-only land of concrete and people. No home, No Hope, No Life; but great sadness and fear. Why can't the kingdom of salvation take them home. fountains of timber and irrigating rivers but as a fountain of life"
"We Are part of the Earth and the Eart is part of us. Humankind has not woven the web of life. We are but one thread within it. befalls also the children of the Earth." "For the strength of the Pack is the Wolf. And the strength of the Wolf is the Pack". on the weak, where others see an animal on top of a hill howling at the moon. Some of us two legged creatures, like myself see the loyalty to the pack. Contrary to what many people believe, the wolf is a very social creature. and patrolling their territorial boundries. 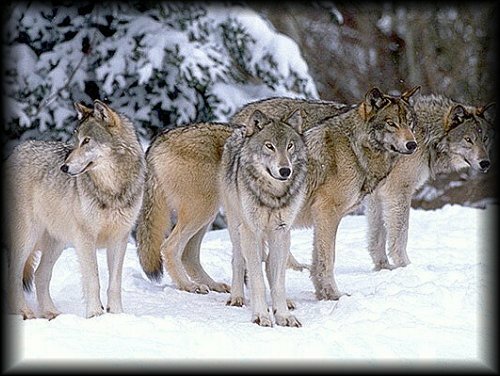 The second in status of the pack are the majority of the rest of the wolves. 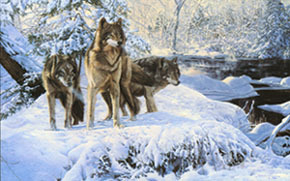 the pack know status and mood by way of vocalization. Wolves generally hunt at night in populated areas and elsewhere by day. and chase down their prey in the open. Meet Rittle my Adopted Homepage Guardian. He is a young wolf who still has some things to learn but he is a good page guardian. He is said to be a bit mysterious and can grant wishes. He is my good luck charm. This Ring of the Wolf site is owned by Mark David Keyworth. Want to join the In The Company of Wolves? 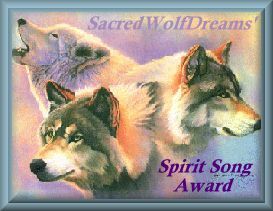 Graciously given to me by Connie at "Reference to the Wolf"